Configure your campaign with various features and customizations to meet your fundraising needs. Below we will show you how different campaign types work together. 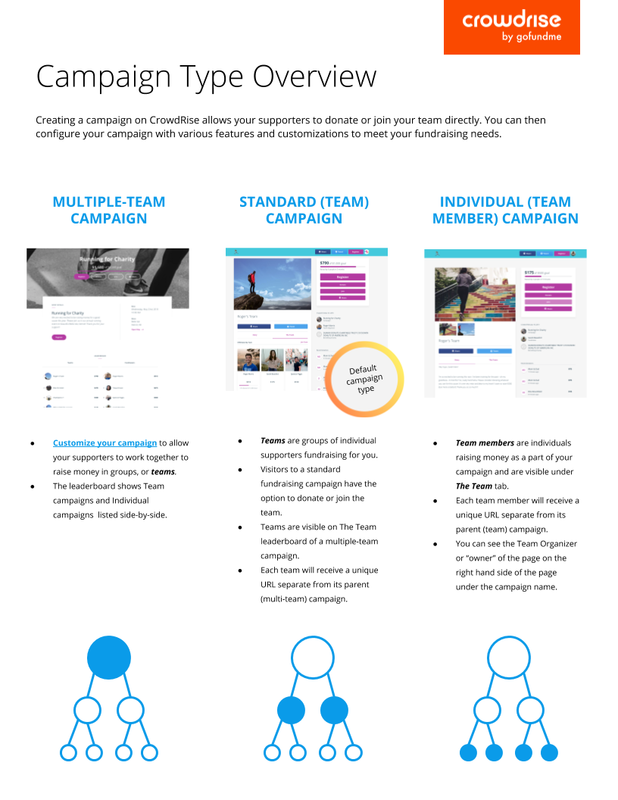 Creating a campaign on CrowdRise allows your supporters to donate or join your team. From there, you can configure your campaign with various features and customizations to meet your fundraising needs, such as by adding Multiple Teams, disabling team fundraising, or adding registration. Adding Multiple teams to your campaign allows your supporters to fundraise in groups and create their own teams. The layout of your campaign will change to accommodate teams. This is what your campaign’s main landing page looks like if you’ve enabled Multiple Teams. * This is the "top layer" of your Multiple-team campaign, whereby every other team and fundraiser exists within it. If we take a closer look at the Leaderboard, we see Teams and Fundraisers listed side-by-side. The Teams and Individuals are listed from highest to lowest raisers on either side of the leaderboard. *Note: In this example, we have also added registration. Doing so creates the Event Details panel that appears below the banner image. Teams are comprised of Fundraisers. Fundraisers are individuals raising money for your campaign. On a Multiple-team campaign, Fundraisers work together to raise money on Teams. Click into a Team to see the Fundraisers on that team. Fundraisers are visible under The Team tab. Click on The Team tab to display all fundraisers who are a part of the Team. Tip: You can see the Team Organizer or “owner” of the page on the right hand side of the page under the campaign name. Click on an individual Fundraiser to view their unique fundraising page. For example, if you click on teammate “Sarah Beaufort,” you can view her fundraising page. Tip: The owner of the fundraising page is indicated at the end of the URL (the URL “slug”) e.g www.crowdrise.com/climb-for-socialfundraising/sarahbeaufort. Here, you can see that Sarah is part of Team “Roger’s Team,” but she has customized her own Story section and added an additional photo. Note: Each fundraiser who joins a Team will inherit the organizer’s Story and Campaign Photos by default. They may choose to write their own Story and add their own unique photos to showcase their personal relationship to the cause they’re supporting.